D & C Carter Property Maintenance - Fascia/Soffits/Guttering, Roofer, Windows/Doors/Conservatories based in Basingstoke, Hampshire. 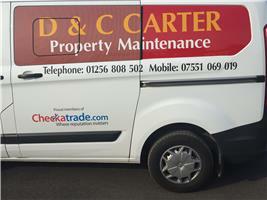 D & C Carter are specialist in all aspects of Property Maintenance. With over 25 years experience in UPVC fascias, guttering, roofing and brickwork. We pride ourselves on customer satisfaction so if we quote for a job we will do that job to the highest of standards and the quote we give you is free. external wall rendering, external painting. We are also skilled in feature walls lime re-pointing, patios, driveways, turfing and all aspects of hard landscape.